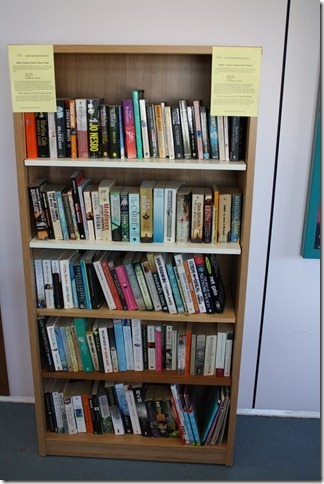 Last month Katrin Bain of the Charlton Central Residents Association got in touch with the exciting news that South-Eastern rail had agreed to open a bookcase in Charlton Station. They’ve now had everything sorted, and they launch this week! As you can see from the picture, the new shelf looks brilliant. They have an official opening this Friday (the 27th) from 9am – 9.30am in the ticket hall of Charlton Station. The local MP Nick Raynsford will attend, and there will be coffee and buns on offer and story time. There will also be story time for the kids. If you live locally, head on down and say hello – they’d love to see you! Here at Book Swaps for London we’re always happy to see a new swap being set up, so many congratulations to Katrin and the CCRA – hopefully people will be book swapping in Charlton for years to come!